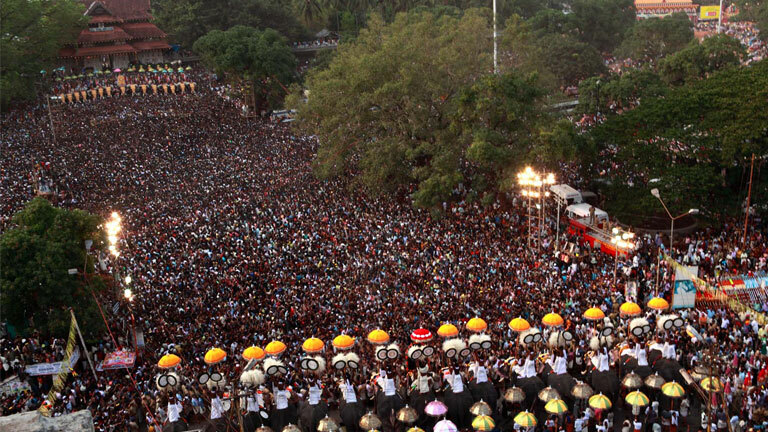 Known as the festival of festivals, Thrissur Pooram has a tradition of more than 200 years. This spectacular event was started by Sakthan Thampuran, the erstwhile ruler of Kochi. Held on the Moolam asterism in the Malayalam month of Medam (April-May), festival related events take place at the Vadakkumnathan temple situated in the heart of Thrissur town and the adjoining Thekkinkadu ground. The pooram festival mainly happens between two groups representing the geographic divisions of Paramekkavu and Thiruvambadi. They will compete in their respective presentations of richly caparisoned elephants, traditional orchestra called panchavadyam, the swift and rhythmic changing of brightly coloured and sequined parasols called kudamattom and the dazzling fireworks in the early morning hours are the festival highlights. The procession taking the representation of the Goddess of Thiruvambadi to Brahmaswam Mutt; arrival of the procession to the mutt accompanied by panchavadyam called madathil varavu; the pooram setout of Paramekkavu temple by noon and the one-hour long chembada melam (melam means orchestra); Ilanjithara melam (orchestra held in front of the Ilanji tree); Thekkotirakkam ; meeting of the two temple groups of Thiruvambadi and Paramekkavu; Kudamattom (exchange of colourful parasols), the small-scale fireworks; the panchavadyam (traditional temple orchestra) at night; the major fireworks at early morning; the pakal pooram held on the next day; the fireworks following it and finally the conclusion of pooram festivities with the ceremonial departure called upacharam cholli piriyal are the main events of the pooram festival. The goddesses of Thiruvambadi and Paramekkavu are believed to be taking part in the pooram. Though the presiding deity at Thiruvambadi is Lord Krishna, it is the second in importance deity of Goddess Bhagavati that takes part in the pooram. There are also eight other temples taking part, but some exclusive rights as part of pooram are vested with Paramekkavu and Thiruvambadi temples. Those rights include rights on the path surrounding the Vadakkumnathan temple and also fireworks and exchange of parasols. The festivities on the main day commence with the arrival of poorams from eight temples. By 6.30 in the morning, the first pooram of Kanimangalam Sastha temple will arrives at the Vadakkumnathan temple, followed by others like Karamukku Bhagavathy, Choorakattukavu Bhagavathy, Naithilakattu Bhagavathy, Laloor Bhagavathy, Panayckambilli Sastha, Ayanthol Karthiyayani Bhagavathy, and Chembookavu Bhagavathy.